A simple recipe of mung dal with seasoning. This is beneficial for digestion. Next time you have a day full of indulgence, go for this simple dal for the next meal and give your system some rest. 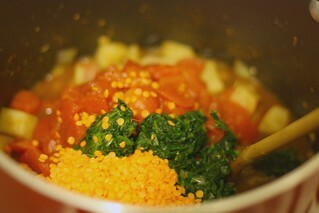 – Add chopped tomatoes and saute for another 3-4 mins and when cooked, add pressure cooked dal and boil. I would like to get a personalized diet plan from you…how do I go about it and what are your charges for the same. I am sorry , but we have halted our diet services till feb 2016. if you can wait for that long , please leave us a mail at care@dietburrp.com and we will get back to you as soon as we resume with our services. can we have this during any of the days of GM diet?